Here at Anthos Properties we offer a variety of leasing options that truly work for each of our residents and their changing needs. 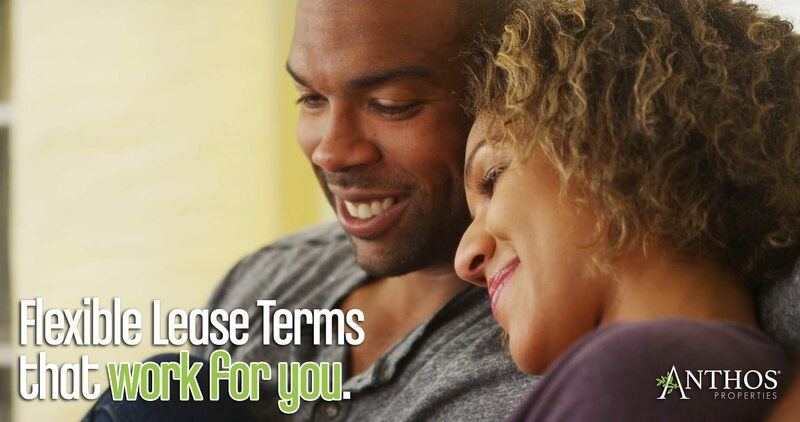 We offer flexible lease options because of the convenience and peace of mind it gives our residents. With leasing options consisting of month to month, 6 months, 12 months, or longer, we believe these options allow our residents to rest assured they can find a place to call home without the stress of getting locked into something they can’t find a way out of. We are here to help our residents simply find a home and by providing flexible lease terms, we believe our residents find comfort in knowing they can come and go on their own terms. To discover the exact details of each property and the lease options that apply, we invite you to contact the property directly and/or schedule a tour when you have the time. During the tour you will be able to ask any questions you may have and you will be provided with all the information you’ll need to make this very important decision. Since each one of our properties is different, we invite you to take a look and find the one that’s right for you.